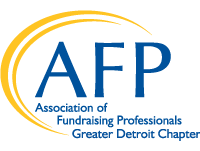 (Arlington, Va.) – The Association of Fundraising Professionals (AFP) Greater Detroit Chapter has been named a 2019 Ten Star GOLD Chapter. Less than 20 percent of AFP’s 243 chapters earn the Ten Star Gold Chapter recognition, making the Greater Detroit Chapter one of the association’s leading chapters around the world. For more information on the Ten Star Award process, please visit www.afpglobal.org. Since 1960, AFP has inspired global change and supported efforts that generated over $1 trillion. AFP’s more than 31,000 individual and organizational members raise over $115 billion annually, equivalent to one-third of all charitable giving in North America and millions more around the world. For more information or to join the world's largest association of fundraising professionals, visit www.afpglobal.org.